So Cal Youth Theatre was in the house for Palos Verdes High School’s closing performance of Joseph and the Amazing Technicolor Dreamcoat and our only disappointment was that the show ended. This was a fantastic show! We wanted the cast to do an encore or at least extend their run. KJ0_0058 – Version 2Joseph opened on April 15th and ran for 2 weekends in the 235 seat multi-purpose room of Palos Verdes High. Every performance was sold out, and as the Director Mrs. Nicole Thompson escorted us to our front-and-center seats, she informed us that curtain would be a bit delayed as she was trying to seat the waiting list of 15. The High School is trying to get the School District to build them a new performing arts center and we hope the powers-that-be saw this show, because this school deserves one! Speaking of seats, when you go see a performance at Palos Verdes High, buy the Premier Seats. Not only do you get the best seats in the house, you also get a nice spread of free drinks and snacks at intermission. Joseph and the Amazing Technicolor Dreamcoat is a musical or operetta with lyrics by Tim Rice and music by Andrew Lloyd Webber. The story is based on the “coat of many colors” story of Joseph from the Bible’s Book of Genesis. This was the first Lloyd Webber and Rice musical to be performed publicly. The show has little spoken dialogue; it is completely sung-through. It is set in a frame in which a narrator is telling a story to children, encouraging them to dream. She tells the story of Joseph, another dreamer, who was sold into slavery by his jealous brothers, but did not give up his dreams. Being a Webber/Rice musical, this vocal score is very demanding, particularly for the Narrator as she sings in almost every number of the show. Narrator Brooke Vanderdonck was excellent. She has a big range, powerful voice and handled the intricate rhythms with ease. She also maintains a strong presence on stage without stealing focus, as she is, after all the Narrator. The importance of dreams and a higher calling is a theme of the show. When Joseph powerfully sings “I was promised a land of my own” in the number Close Every Door To Me, lyricist Rice is speaking about all the children of Israel, not just Joseph, which made this the perfect show to see during Passover. Joey Bacon as Joseph is perfect in both singing and acting. He brings a delightful innocence and naiveté to the role. We watch him grow into the strong man who would be the Pharaoh’s number two, but not lose his core goodness as, in the end he forgives his brothers. The entire cast is stellar. Every ensemble member sang and danced their heart out as there are so many different styles and times in this show – from country western to roaring ‘20s to the go-go boots sound of the ‘60s. Sue Secrist, the Vocal Director did an excellent job. You could hear perfect harmonies and exciting dynamics. The Children’s Choir was a delightful addition. Not every production of Joseph includes one, but this choir added to the vocal sound of the show as well as the visual. You might think the 11 brothers would function as an ensemble, but this delightful bunch of young men, and 2 young women credibly playing men, each put their own personal spark into their character and each of the brothers had a distinct personality. Alex Gordillo got a great chance to shine as brother Reuben leading the big country western number One More Angel in Heaven. Alex Katnic, brother Simeon was delightfully mournful in the French lament Those Canaan Days. In fact, every brother got a few lines in that number and it was fun to see each different personality. Director Nicole Thompson and Choreographer Niko Montelibano masterfully led us through different styles and eras. It was fun to see Khor Gracie play Potiphar as a gangster from the ‘20s. His heel-toe walk was a great character choice. Lexis Henderson was wickedly seductive as Mrs. Potiphar flanked by her fun flapper ensemble. A big highlight was the Elvis number, Song of the King masterfully handled by Terren Mueller as Pharaoh with lots of hip grinding and interacting with women in the audience. Ryan McGowan, as the crooning Caribbean Judah also had fun with the audience, choosing a front row Mom to play the part of poor accused Benjamin in Benjamin’s Calypso. This Mom really got into it, dancing along with the island beat. Mentioning all the different styles of this musical would not be complete without a salute to the Band and Musical Director, Shellie Parkinson. It’s not often that you get to hear a live band during a student production and this one, made up of PVHS music students, was excellent! There was so much wonderful attention to detail in this production. Kudos to Carin Jacobs for Costume Design. While all the brothers were in some kind of robe, each was a little different reflecting their personality. For each number, the costumes fit the period or style perfectly. Whether it was full flapper dress and gangster suits, or gold lamé pants and cat glasses from the 50’s or just the addition of a cowboy or fruit hat, the costumes really set the stage. The set itself was minimal, and that was perfect. Matt Scarpino designed a big platform with some steps and a few moving set pieces– just what was needed for big production numbers. 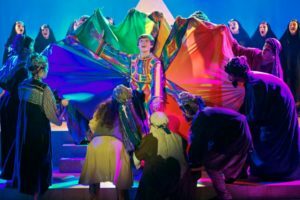 Lighting becomes part of the set in a musical on a big stage, and Lighting Designer Steve Giltner beautifully set the mood of each scene, from the dark sale of Joseph into slavery to the bright glittery Elvis production number. Our hats also go off to stage crew. The scene changes were choreographed perfectly. Only someone who has done musical theatre might notice this, but as the brothers moved downstage, away from their cabaret tables, in the number Those Canaan Days, they put their chairs on top of each other, so they would be easier for the crew to move. Props don’t often get mentioned in a review, but Robyn Bockrath and Dana Dixon’s stuffed lamb that was slaughtered to make Jacob think Joseph was dead, got a huge laugh as it came apart. Every moment of this production was exciting and fun, poignant and often funny. It was interesting to note the Director’s choice to play with different times and periods. For example, the Narrator first appears in a modern casual blazer over her simple tunic dress with the suggestion of an ancient symbol. The children are dressed in modern school uniforms. It is a UPS man in brown who delivers Joseph’s coat to Father Jacob. The Narrator takes a picture of the brothers with a Polaroid camera. In the midst of the number Joseph’s Coat, with all the family in ancient garb, the children suddenly appear in modern colorful clothes. That mixture of old and modern helped the audience keep in mind that we are telling a story, and a timeless story at that. It was Director Thompson’s strong vision and attention to that kind of detail that brought this strong cast together with an excellent creative team and crew to make a production of Joseph that kept us engaged and thoroughly entertained from start to finish. It would be wonderful to tell you to run to see this production, but alas, this was the last show. Given the quality of the performances at Palos Verdes High School, under the direction of Mrs. Thompson and the Performing Arts Program staff, you might want to plan to see all their productions – hopefully in a brand new theatre!